iBooks 3.0 was announced today at Apple’s event, and is available now on the App Store. Is it just me, or does calling this update “3.0” feel like a overstatement? A new (continuous) scrolling mode (that doesn’t work with fullscreen), some new languages, and “iCloud” sync that, as far as I can tell, is *identical* to the sync it’s had from day one (suns reading position and lets you download purchased books)? That’s it? Am i missing something? This should have been a labeled a minor point release, not “3.0”. Oh, and iBooks Author got an update, too. Some new themes, and you can now make portrait-only books. Be still my heart. Why do I even care? Because I’m an avid ebook buyer and reader (several per month). 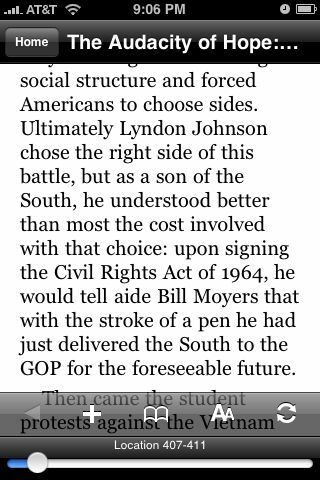 I love my iPhone and iPad and I love reading on them. I want to love iBooks. It’s gorgeous. But I find myself doing all my reading in the Kindle app (and hence, buying from Amazon). iBooks offers no benefits I can see over the Kindle app and ecosystem. I guess I’m kind of rooting for Apple to do something groundbreaking and spectacular here, not because I love Apple, but because I love books. That’s why this “update” underwhelms. 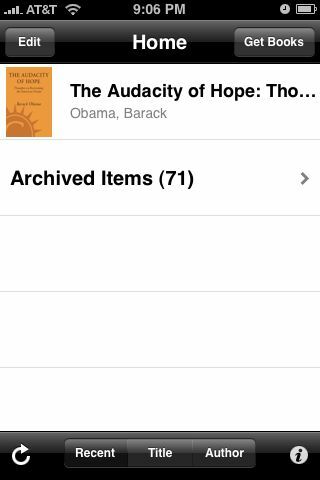 iBooks could be so much more. 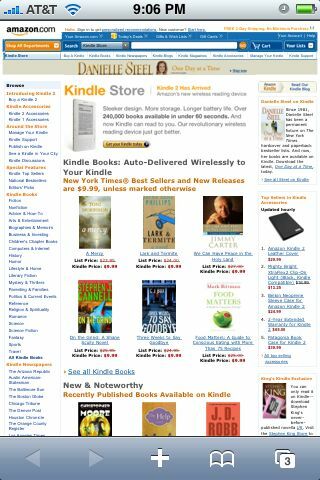 I’ve been waiting for this moment almost since I heard about the Amazon Kindle (affiliate link). I dreamed of a simple app they could write for the iPhone that would sync with my Amazon account, to let me download and read my Kindle books on my iPhone, sync my place between the two devices, so I could hop back and forth as much as I wanted, and basically turn my iPhone into a little “mini Kindle”. Even though I take my Kindle most places I go, there are times when I forget it, and want to read something. 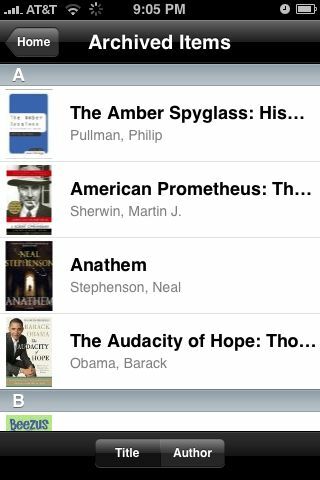 Since I’m never without my iPhone, I usually just read feeds or something, but now, I have my whole world of ebooks, at my fingertips across multiple devices, stored and synced on the cloud. Tonight, my dream came true. I noticed (on Twitter, or FriendFeed, I don’t remember) someone wondering how page turning should work on the iPhone Kindle app. “Is that out?” I asked myself. 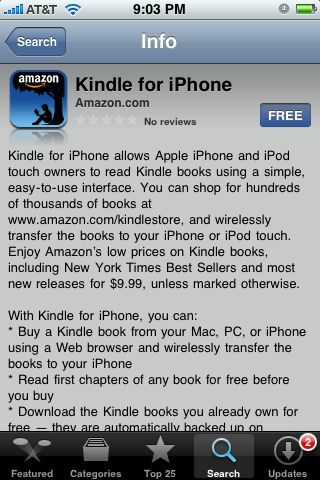 A quick Twitter search for iPhone and Kindle revealed that yes, in fact, it was available in the App Store. After one super excited tweet, I was off to download it. 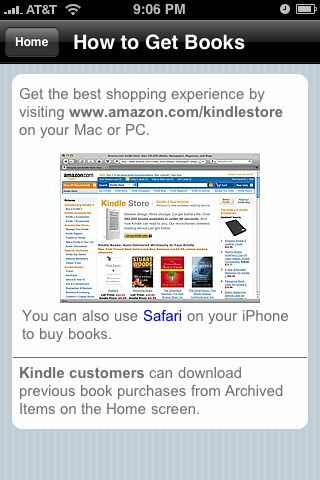 The desktop version of the Kindle Store web page in Mobile Safari. This works, but is obviously not optimized for the iPhone. 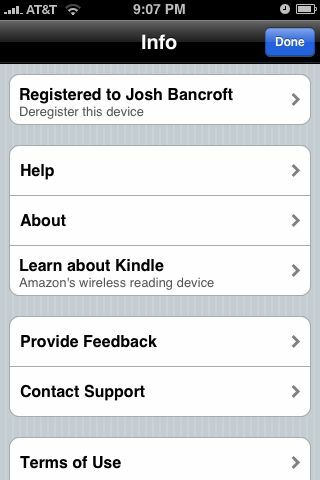 Last time I tried, you couldn’t browse or buy Kindle books in the iPhone version of Amazon.com, or using the Amazon iPhone app. Maybe that will change. The Options Screen. Pretty basic, only real option is to deauthorize your iPhone from your Kindle account (important to remember, since you have a 5 device limit). In conclusion? This is awesome, long awaited news, and I can’t wait to play with it some more. Am I going to read less on my Kindle and more on my iPhone? Maybe, maybe not. I’ll likely end up reading more in general, now that I can access my Kindle books (and my saved place!) on my iPhone, and I can’t wait. 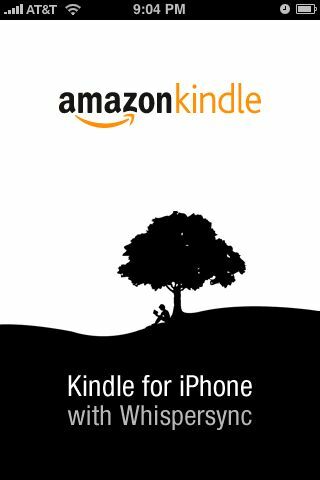 One interesting thing this opens up: now, people can download this free iPhone app, and spend money buying Kindle books from Amazon, without ever buying an actual Kindle. Amazon Kindle 2.0 Coming February 9? I have been a huge Amazon Kindle fan and evangelist for quite a while (yes, that’s an Amazon affiliate link – make me rich! :-)). I did an excited video unboxing of mine when I got it, and I’ve written about it a fair amount since then. I use it an hour or two every day. I don’t know exactly how many people have been led to buy a Kindle after getting a breathless demo from me, but it’s more than a dozen. I’ve signed up for and done “See a Kindle in Your City” show and tell events. It goes with me in my cargo pants pocket everywhere. I pretty much love the thing. So of course, I’ve followed the rumors of the next Kindle version pretty closely. Besides some pretty convincing photos of what Kindle 2.0 might look like that leaked on Boy Genius Report last year, there hasn’t been a whole lot of credible information on the subject. For most of its life, Kindle has been almost synonymous with supply problems. After it sold out in hours when it launched in November 2007, you had to wait 1-2 months for delivery of a Kindle. This persisted through April 2008, and happened again around the 2008 holidays (blame Oprah for that one). All year, the rumor mill has been on fire with Kindle 2.0 speculation – TechCrunch, Scoble, you name it, they’re predicting a new Kindle. Amazon has been typically coy, and has only said “the soonest we’d do a new Kindle is next year”. Well, now it’s next year, and there’s something afoot. The New York Times reports that Amazon is holding a press event at the Morgan Library and Museum in New York City on February 9, and that Jeff Bezos is going to be there. They haven’t said this event will have anything to do with a new Kindle, but given the fact that the original Kindle launch was held at a similar venue, this is like Apple saying “we’re going to have a music-themed press event, and Steve Jobs is going to be there, but we’re not going to tell you what we’re going to announce.” Everyone knows that means new iPods. So what will Kindle 2.0 be like? The NYT blog post I linked above has some speculation about a new ebook reader chip from Epson and e-Ink (who makes the Kindle’s distinctive electronic ink screen. Called Broadsheet, it would enable smoother screen refreshes by breaking the screen into a grid of 16 pixel areas that can be individually updated, rather than having to redraw the whole screen (at the cost of 750 milliseconds) every time something needs to be changed. This sounds plausible to me (apparently Sony’s latest Reader device already has the Broadsheet chip), but it’s not mind-blowing. I expect this to be an incremental upgrade to the Kindle, rather than something revolutionary. The big question on my mind is, how will Amazon treat the enthusiastic early-adopter Kindle community when the new device comes out? They’ve legitimately earned a reputation for caring about the people who forked out $400 for one of their devices. They’ve been really lenient about replacing accidentally damaged or destroyed Kindles. They encouraged and even help facilitate people staging “See a Kindle in Your City” events, which means they understand the value of an in-person, hands-on demonstration in order to help people “get” the Kindle. Almost every Kindle owner I know has become an enthusiastic fan and unpaid Kindle salesperson. So what, if anything, is Amazon going to do for us? That sounds really whiny and “entitled”, I know. Tell me how stupid it is in the comments. It would be absurd to hope for “free Kindle 2.0 to all 1.0 owners!” or something that doesn’t make business sense for Amazon. But it would be in line with how Amazon has heretofore treated the early adopter community if they did something like “$100 of the new Kindle for previous Kindle owners”. They’re a big company, their job is to make money. But I can’t help but hold onto a sliver of hope that they might do something nice, even though they don’t have to (sort of like Apple did with it’s $100 rebate for 1st gen iPhone buyers). (Over on the Intel Software Network blog, software ninja Clay Breshears put up a post today about why he will “Never Own an Electronic Book”. Turns out his frustration stems from how hard it is to search for something, if you don’t know exactly what you’re searching for. This is a problem not just for ebooks and readers like the Kindle, but for the web and our text-oriented world in general. Clay, you make a very good point, but it seems to be aimed at the effectiveness of search in general, rather than just on ebook readers (though they suffer in the same way). Just like prices can only come down, I hope that natural language search can only get better from here. It shows you how many results were found in each book, and by selecting that book, you can quickly skip back and forth between the hits. 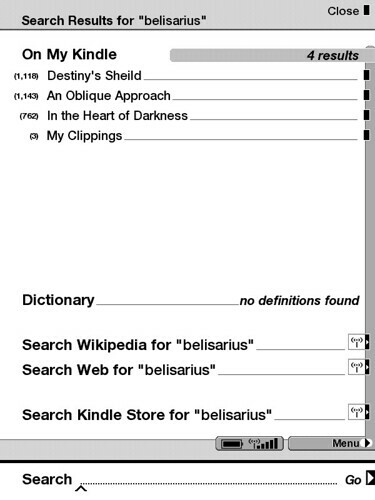 Notice that there are also options to find results from the web, Wikipedia, the Kindle Store, and the built-in dictionary on the Kindle, if what you’re looking for isn’t in one of your books. Living in Portland, we frequently visit the Oregon Coast (at least once or twice a year). It’s only about an hour’s drive away, and it’s breathtakingly beautiful. Some of our favorite places to go are Tillamook (the cheese and ice cream factory! ), Cannon Beach (Mo’s and Tolovana Park are great, as is Ecola State Park), Seaside (kitschy promenade, etc. ), Lincoln City, and Newport. There are tons of really nice little towns along the coast, too. Honestly, my favorite coast activity is just driving Highway 101 – the road is fun, and the scenery is out of this world. We took a little family vacation to the coast last weekend, and of course, I can’t turn off my geeky parts (though I did leave the laptop at home – a first for me!). So I was paying attention to what kind of cell phone data coverage I was seeing, whether it was 3G or not, and what kind of speeds I was getting. I had three devices with me to test: my iPhone 3G, my wife Rachel’s original iPhone, and my Amazon Kindle, with it’s cellular “Whispernet” radio that works on Sprint’s EVDO data network. In the past, cell phone coverage (even for voice) was spotty. You were probably OK if you were in one of the big towns, but outside that, you were out of luck. Data coverage was slow and spotty. Things have improved greatly in the last few years, and the one impression I got from this trip was that not only has cell coverage in general gotten MUCH better on the Oregon coast, 3G has arrived in a big way. It was really nice to be able to stay connected so well. First, the iPhones on AT&T’s network. When they first started rolling out 3G (before the iPhone), the fast HSDPA data service was only available in 20 or so major metro areas. Cities like Portland and Seattle were covered, but not the towns in between, and not at the coast. AT&T has been building out it’s 3G network at an aggressive rate – no doubt in part because of the iPhone 3G. This weekend, except for localized “dead spots” (like our hotel room, in a deep hollow and right on the beach), where I didn’t have much signal at all, I had great AT&T 3G HSDPA coverage in all of the towns we stopped in: Seaside, Cannon Beach, Tillamook, Lincoln City, and Newport. I did some speed tests in a few places, and averaged roughly 600Kbps – about the same I get in the Portland suburbs. I also did a few tests on my Kindle. I honestly wasn’t expecting much coverage, but I was pleasantly surprised. In the places I checked (mostly in Lincoln City, where we were staying), I had 4 or 5 bars of EVDO signal, and while I didn’t do any speed tests, it felt just as zippy as anywhere else I’ve used it. Which was great, because I really, REALLY needed to download the book Breaking Dawn (book 4 in the Twilight teen vampire saga – guilty pleasure!) the instant it became available at midnight EST on Saturday night. 😉 At 9:02PM PST, I made the purchase, and less than a minute later, I started reading (the book is EXCELLENT, by the way! – Affiliate links to the hardcover and Kindle editions). So, it’s nice to see that the cell carriers (well, AT&T and Sprint, at least) are improving their coverage on the Oregon Coast. Now I can count on staying connected when I’m there, and a few people have asked me about my experiences with coverage there, so hopefully they’ll find this post through Google or however, and get their questions answered. Can the Kindle Do For eBooks What iPods Have Done For Music? Next in a long series of thoughts about electronic books an the Amazon Kindle: can the Kindle have the same kind of huge, mainstream success, and become embedded in our culture like the iPod has? You can read my previous posts on the Kindle, including my Two Month Review (and Washington Times interview), Why eBooks are a Great Entertainment Value, my Rebuttal to Kindle Critics, and my video Kindle Unboxing and First Impressions. Each of those posts has some great discussion in the comments, and I’d advise you to read them if you’re interested in the topics. Now, on to the topic at hand! Comparisons between the Kindle and the iPod are inevitable. Some say (and I’m among them) It could do for books and reading what the iPod has done for music and listening – make it a very digital, customizable, personal experience. Part of the draw of iPods, I think, is the ability to bring your whole music library with you, and mix it up and listen to it in whatever way you feel like moment to moment. The Kindle seems similar on the surface – they even use some of the same terminology (“library”, etc.). The terms of the DRM (Digital Rights Management) restrictions on Kindle books and iTunes music files are also very similar – you can only use the digital files on devices from the manufacturer from whom you purchased the iPod/Kindle, you can authorize up to 5 devices to share the files within your family, but not with thousands of your closest friends on the internet, etc. You are permitted to load up free files that you’ve obtained from elsewhere. The promise of the Kindle seems to be the same as that of the iPod – you can bring all of your digital books with you, and read them however and whenever you want. Lots of people just don’t like to read. Steve Job said as much when he was asked if Apple was working on a Kindle competitor (though many took that to be tacit acknowledgement that Apple IS planning such a device – just like when Jobs said “no one wants to watch video on an iPod” years ago). Speaking as an avid reader, and lover of words and books in all their forms, it saddens me to admit this. But I know lots of people who just don’t enjoy reading. And it’s going to be almost impossible to convince that set of people that they should buy a Kindle. So why do people love their iPods so much? Most of us like music, and even if you’re not a full blown music lover, listening is a passive activity – it doesn’t take much effort – so it makes a nice background filler. Personally, I love listening to podcasts – they make me smarter. Plus there’s the “cool” factor – wanting to be seen with the latest iPod dangling from those white headphones, wanting to express yourself through your playlists and preferences. So even if you don’t think of yourself as a music lover, there are lots of reasons to own and use an iPod. No one is ever going to be considered “cool” for walking around with their nose in a Kindle (although I do know people who express themselves through the books that they read in public – nothing tells the world you’re a science fiction lover like reading a Cory Doctorow paperback on the train – something the Kindle can’t do). Why the stigma against reading? I’d say that often it goes back to our school days, and the whole “smart kids” versus “cool kids” culture clash. Those habits and preferences are deeply ingrained. For these reasons, I don’t think the Amazon Kindle, or eBooks in general, are ever going to be as popular, culturally or commercially, as the iPod and digital music. That doesn’t make it less important. I’d argue that the Kindle and digital books are likely to change and influence people on an individual level, because of how much more stimulating reading is for your brain compared to listening to music. And for that set of people who DO love books, words, and reading, even if they’re not technologically inclined, there’s a lot to love about the Kindle. It won’t make you into a book lover, but if you’re already of that ilk, the attraction of the Kindle is just as powerful as bopping your head to the latest tunes with those white earbuds in your ears. A few weeks ago, I was contacted by Kelly Jane Torrance, a reporter for the Washington Times. She was working a piece about the Amazon Kindle ebook reader, and had seen my Kindle unboxing and initial review video. We conducted an email interview, part of which went into her final article in the Washington Times (“The Carry-On Library” – beware popups). Of course, all of my lengthy replies didn’t make it into the article, so I’m posting them here. Consider this my “two month” review of the Kindle – that’s about how long I’ve been using it. Read on for the rest of the interview/review. How long have you had your Kindle? I’ve had my Kindle for about a month and a half, since they became reliably available in mid-April. But I’ve wanted one ever since they were released in November 2007 (and subsequently sold out in 6 hours). Why did you decide to purchase it? I’ve been a long time fan of ebooks. I’ve read hundreds of them on various PDA and phone devices over the last few years. Needing to touch a physical book as part of the reading experience stopped being an issue for me a long time ago. The convenience of being able to take a library of hundreds of ebooks with you on a small device is very appealing. Already a fan of ebooks in general, I wanted a dedicated reader device with an electronic ink screen (super high contrast and DPI, low power usage). Among the dedicated eInk reader devices out there (Sony Reader, etc. ), I chose the Kindle for a couple of reasons. First is the Kindle Store – the almost-150,000 books that Amazon has made available to purchase and read on the Kindle. You could have the greatest ebook reader device in the world, and without a great library/store, it would fail. I figure if anybody can do the “electronic bookstore” right, it’s Amazon. Second, the Kindle has a built-in unlimited cellular wireless data connection. That means it can access the internet and the Kindle Store almost anywhere there’s cell phone coverage, with no monthly fee. Besides being able to look things up on Wikipedia, or browse the web, this means I can go from “I want to buy a new book” to having the book purchased and downloaded to my Kindle in a matter of minutes, from anywhere. You mentioned you have an iPhone, so are you the sort of person who tends to buy the latest gadgets? I’m definitely the kind of person who always wants to have the latest gadgets. I’m a geek all the way down to the core. Interestingly, it was when I bought my iPhone that I stopped reading ebooks, because there was no ebook software for the iPhone, and it replaced the other mobile gadgets that I used to carry. So when the iPhone came along, I went back to buying “dead tree” version of books. I lost the advantages of ebooks, and the paper books I was buying started piling up all around my house. Have you always been a big reader? Yes, I’ve been a voracious reader all my life. It drives me crazy to have a few minutes go by without something for me to read (either on my Kindle, or reading the web on my phone). How many books do you read in a month/year? I read probably 6-8 books a month, around 100 per year (first time I’ve counted that up – yikes!). What sort of things do you find yourself reading on the Kindle? I find myself reading mostly books from my favorite genres on my Kindle – science fiction, history, computer books. Besides the books that are available for purchase from Amazon, I read a ton of free books that are available from places like Project Gutenberg, Creative Commons, and the Internet Archive. Many of my favorite authors, like Cory Doctorow and Charles Stross, have embraced Creative Commons (“Some Rights Reserved”) as a way to distribute their work for free in order to gain new fans. Cory Doctorow has written extensively on why he follows this model (the basic argument is that for most authors, your enemy isn’t piracy, it’s obscurity), and in my case, at least, it works. I buy hard copies of Cory’s books to give to friends, as well and recommending they get the free versions of his books. He and others like him have gotten way more money out of me this way that they would have if they followed the traditional publishing model. I am very happy with my Kindle purchase. I use it every day, and I love it more and more. I read to my daughter from it every day (she calls it my “magic book”, the best way I could think of to describe how it works to a 5 year old). I highly recommend it to anyone who loves reading. What have been the best things about the device? As a concept, the best thing about the Kindle and ebooks in general is being able to hold hundreds (or thousands) of books in one physical device. As a device, I love the electronic ink screen on the Kindle, and the built-in wireless connection (and the fact that Amazon doesn’t artificially block you from using the web with it). The battery life is stellar (with the wireless radio turned off, battery life is measured in thousands of page turns, which translates to days and days of active use). The design and layout, while controversial, becomes immediately comfortable when you start using it – you can tell why it’s designed the way it is as soon as you hold it in your hand. For me, it has changed reading the same way MP3 and iPods changed music. It’s a real-life Hitchhiker’s Guide to the Galaxy. Anything you’ve been dissatisfied with? My only real complaint with the Kindle is that I wish the page would refresh faster when you “turn” it. The refresh time is about 750 milliseconds – three quarters of a second. I understand why this is – the electromechanical eInk screen just can’t flip all those pixels very fast. This will improve as the technology matures. But it’s still irritating sometimes, when the Kindle can’t keep up with me and my page turns. I also feel a little guilty when visiting my favorite local independent bookstores. I still go there, browse, and buy books that aren’t available or wouldn’t work well on the Kindle (photography books, etc. ), but I’m spending a lot less time and money there than I used to. Have you shown your Kindle to others through the forum on Amazon? Yes, I posted a “See a Kindle in Portland, OR” in the forum that Amazon set up for this purpose. A couple people came, including another Kindle owner (at the time, the only other Kindle I had seen “in the wild” besides my own). Since then, I’ve been keeping loose track of how many people in Portland have a Kindle – we’re up to 8 or so that I know of (and a whole lot more that I don’t know about, I’m sure). Do you find people coming up to you to ask about the Kindle? And do you enjoy showing it off? Have you traveled with your Kindle? I have traveled with my Kindle, and it’s one of the most brilliant uses for the device. A few weeks before I got my Kindle, I took a two week trip to Shanghai, China. I brought a “dead tree” book with me to read during the trip. I finished the first book before I even left my home airport, and bought another one there. I finished that one by the time I got to San Francisco, and bought another one there. I finished that one before we landed in Shanghai. While I was there, I bought a couple more books, which were sufficient for the rest of the trip. By the time I got home, I had been carrying these five or six books in my luggage all over the world. It was that experience that gave me concrete evidence of how a Kindle could simplify my reading. Could you see yourself taking it to the beach and places like that? I take my Kindle with me everywhere I go – it has a semi-permanent place in my cargo pants pocket. I take it to work, to appointments, to meals, everywhere. I love being able to read for a few minutes when I have the chance. Did this factor into your decision to buy — To me, this seems like one of the biggest benefits, being able to get what you want wirelessly, without having to carry books or worry you’ll run out of reading material. This is exactly why I love my Kindle – being able to read what I want, when and where I want, and get new stuff to read easily and quickly, and I can carry it all around in my pocket. I’ve had my Amazon Kindle ebook reader for a few days now, and my Kindle unboxing video and “first impressions” post has generated a TON of great comments, and I’ve tried to respond to them all. I wrote WAY more in responding to people’s comments than I did in the original post, so make sure you go read through it all if you’re interested. Here’s the way I’ve always looked at ebooks and DRM and value. For background sake, you should know that I’ve spent hundreds, maybe thousands of dollars on ebooks in my life, mostly from eReader (formerly Palm Digital Media, formerly Peanut Press), and ready on the various Windows Mobile devices that have found themselves in my possession over the years. Instead of comparing the cost of a DRM’ed ebook that I’ll, in all likelihood, only ever read once, I look at it this way: Is the $9.99 (or less – $9.99 is about as much as I’ll pay for an ebook) worth the number of hours of entertainment you get from it? A movie gives you roughly two hours of entertainment/diversion for about $10. More if you buy snacks (I always buy snacks!). Or you can pay $20 for the DVD. Say $5 to $15 an hour. A magazine gives ME maybe a couple of hours of entertainment for about $5. $2.50 an hour. A video game is $50 (or $29 for DS games) for, realistically a dozen hours of entertainment $4 an hour. A nice dinner out with my wife is maybe $30 to $50 (we don’t go to fancy places) for a couple of hours of enjoyment. $25 an hour. Finally, an ebook, at less than $10, takes me at least several hours to get through (average maybe 10? 15? ), spread out over the course of a few days or weeks. I figure it works out to less than $1 an hour. To me, that’s a tremendous value. I don’t expect any real lasting value or return from the entertainment sources I listed above (with the notable exception of video games – I’m a collector, and I always keep the good ones). I almost never go back and read a book again. There are some exceptions – I try to read The Lord of the Rings once a year or so. I’ve read The Dark Tower series twice (in ebook form). I’ve read most of Cory Doctorow’s stuff at least twice. I just don’t expect much lasting value out of most books I read. If there’s a book that I REALLY want to keep, or have around in the future, for reference, or nostalgia, or whatever, I just buy the dead tree version. And the same “bang for the buck” applies to dead trees, too, minus the convenience of ebooks: acquiring them wirelessly, frictionlessly, carrying around a few hundred of them in my pocket at all times, and being able to read them whenever and wherever I have a few moments of “hostage time”. So, for me, the “bang for tbe buck” or entertainment value quotient or however you want to think about it for ebooks is EXTREMELY high. Much higher than any of the other passtimes and habits I pursue for fun. Sure, the math and values here are fanciful, and are different for everyone, but for me, it’s a cheap habit, no matter how I look at it. Add in the bonus effects that none of those other sources have: books make me smarter, increase my vocabulary, exercise my imagination, inspire creativity, make my conversations more interesting, etc., and it’s a no brainer. Agree with me? Think I’m crazy? Want to share how much per hour you pay for entertainment? Drop a comment, and let’s talk. I finally broke down and ordered an Amazon Kindle, now that they’re back in stock. It’s an ebook reader device, and since I read so much (borderline obsession), and there are growning piles of dead tree versions of books all over my house, I figured a Kindle was a good idea. In this video, we go over the packaging, basic functions of the device, discuss its wireless features, have a look at the fabulous (dare I say revolutionary?) electronic ink screen, and generally check out the new gadget. Camera help and cameo appearances by my wife Rachel and our son Gabe. You can download the higher quality original Quicktime movie file (about 6 minutes, 72MB), or get a code snippet to embed/share this video on your own site by clicking the little “connect the dots” icon in the player above. I’ll be posting more thoughts as I use the Kindle more (I’ve had it less than 24 hours), but the verdict so far is: I LOVE this thing! I only wish I hadn’t had to wait so long for Amazon to get them back in stock. You can find out more about the Kindle, browse the books, newspapers, and magazines available for it, and generally get more information at Amazon’s Kindle page (affiliate link – if you decide to buy one, and use that link, I get a small percentage, which helps to pay for my gadget buying habit).